Pure serendipity brought us to our interview this month with Mort Rosenblum, author and world-renowned foreign correspondent and journalist. 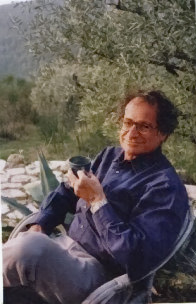 As luck would have it, we were fortunate to catch him at his olive farm, “Wild Olives”, in the south of France and listen to him muse about his long-standing love affair with olive oil. But the reason we wanted to sit down with Rosenblum was not because he was the Associated Press Bureau Chief in far-flung places like Buenos Aires and Kuala Lumpur, and not because he has written books on life in France, including “The Secret Life of the Seine” and “A Goose in Toulouse”, or books on food we are fanatical about like “Chocolate: A Bittersweet Sage of Light and Dark”, but because Rosenblum’s book, “Olives: The Life and Lore of a Noble Fruit” was one of the very first to celebrate the olive and won the James Beard Award for excellence in food writing. “Olives” is truly a classic that after all these years, and the growing popularity of EVOO and books on the subject, has not yet been matched for its thorough and engaging story on the subject. Mort’s latest book, “Little Bunch of Madmen: Elements of Global Reporting” is being released October 1 in the United States and has already received rave reviews. How did you first get involved with growing olives? I had been a foreign correspondent for many years, travelling the world and reporting on subjects from mercenary wars to political upheavals and was just looking for a place to find a little peace. While visiting the south of France, friends showed me an abandoned piece of land so overgrown it looked like Cambodia. It took three long years to clear the weeds, prune the trees and nurture the orchard back to life. In the meantime, I learned about olives along the way and just fell in love with olive oil, the culture surrounding it and the people who are devoted to it. I put it on just about everything but, of course, it depends on the oil. Ligurian olive oil, from olives picked early with a bit of a bite, is amazing on delicate white fish. Drizzling highly-spicy Tuscan oil on cannellini beans with fresh fennel is better than adding pepper. But being from Arizona, I’m pretty partial to using it with really good Sonoran food. I even fry my taco shells in olive oil, it’s so much better. Since you are an obvious aficionado of both olives and chocolate, if you had to choose between the two, which one would win? That’s tough to answer because it is like asking “Who is your favorite kid?” It would be hard to choose between the two, but if I had to survive on one then I’d pick olive oil. I like somebody who follows their principles, instead of people. The Israelis have a great saying that sums it up, “He’s good olive oil”. I might be sitting in it right now. It might just be Wild Olives. But, I have a little parcel of land on Sweetwater Road in Tucson, Arizona that could be a close second. Who would like to change places with for a day? Nobody really. But it might be fun to be Donald Trump for a day, so that I could give away all of his money to people to need it. I’ve just published a new book called “Little Bunch of Madmen: Elements of Global Reporting” that has taken me forty years to write. I’m still a foreign correspondent at heart and I’m really, really worried about how ignorant we’ve all gotten about the world. So what I think we need, more than anything else, are real reporters that can do the research and write about the real issues facing the world. This book is my effort to encourage that. I think it was the first time I went to a 3-star restaurant in France. I had just arrived in France to take a job as AP Bureau Chief in Paris and I did about 15-stars in 5 days. I visited Les Baux de Provence and ate at Raymond Thuiller’s restaurant, L’Ousteau de Beaumaniere. My meal was a visual masterpiece. Everything on the plate looked like a painting. In all my travels, I had never seen anything like it before. I’d like to write another book about France. After living here for 35 years, I want to write about the people and the country I have come to know. By cruising from one end of the country to the other, I’ll be looking for the very best that France has to offer. It’s going to be a really fun road trip.